Discover your inner artist with world renowned polymer clay expert and television personality Lisa Pavelka. Work at your own pace as she guides you through the basics in Polymer Clay 101 and on to six exciting and enticing projects. As each project builds in complexity, your creative confidence will grow along with your mastery of the medium. Lisa also shares variations of each project to further inspire your creativity. It's like having your own one-on-one instruction with Lisa. Projects include: Fabulous Foiled Key Fob, Iridescent Transfer Pendant, Mosaic Keepsake Box and more. 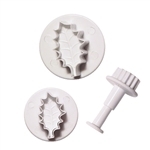 These Calyx Embossing Cutters are ideal for creating beautiful embellishments, accents or jewelry components from moldable mediums. This finding is made of high quality silver plated base metal and is lead, zinc and nickel free! The column is approximately 1-1/2 inches long. This form was designed by Lisa Pavelka and is used as the base for her Swarovski crystal column pendant. There are 12 Crystal Column Forms in this kit. This finding is made of high quality silver plated base metal and is lead, zinc and nickel free! The ball is approximately ¾ inch in diameter. This form was designed by Lisa Pavelka and is used as the base for her Swarovski Great Balls of Crystal pendant. There are 12 Mesh Ball Forms included in this kit. This finding is made of high quality silver-plated base metal and is lead, zinc and nickel free! The oval sphere is approximately 1-1/4 inches long and ¾ inch wide. This form was designed by Lisa Pavelka and is used as the base for her Swarovski crystal oval sphere pendant. There are 12 Mesh Sphere (Oval) forms included in this kit.